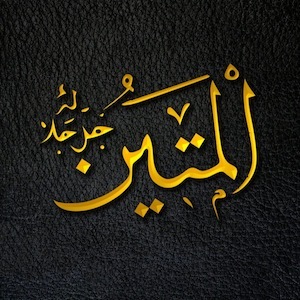 Al-Matin means the One who is firm in strength. Linguistically it also means something that rises and stays, as well as the hard or apparent part of something. God Almighty (exalted is He) reminds us He is Al-Mateen to address any trepidation we might have. We all have worries and fears, and we might even consider giving up on our values and principles for worldly gain. But God Almighty reminds us that He is Firm in strength. Whenever you feel your resolve wavering, hold on to Him. When you feel weak, seek strength from the One who is the Most Strong. When you feel that you cannot be steadfast, hold on to the One who is Firm so you do not slip. God Almighty reveals His Names to us so that we can turn to Him in every situation and be reassured no matter what troubles there are around us. Whenever you feel unsure, turn to Him and understand His Names and attributes so that you can have certainty that God can address all your fears and hesitation.